I have two new titles from LB-Kids to share with you today. And if you stay with me through the end of this post, you can also enter the giveaway for a chance to win both of these titles! The first is a newly released copy of Clement C. Moore's The Night Before Christmas . Holly Hobbie's watercolor layouts brings this story back to life. It is the classic poem as seen through the eyes of Hobbie. Here's where I confess that I didn't realize that Holly Hobbie was an actual person. I thought it was just a character and did not realize that the character is also her namesake. I think I had a Holly Hobbie doll growing up. 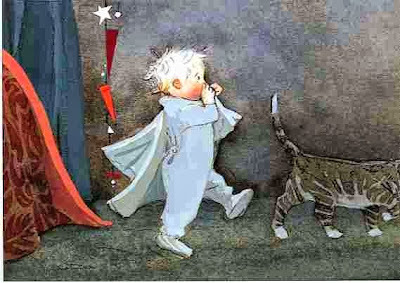 At any rate, her watercolor pictures are very familiar to me and that might be part of the reason why I like this new take on The Night Before Christmas - it feels like a very familiar old friend. Secondly, I was sent a copy of The Very Fairy Princess Sparkles in the Snow . 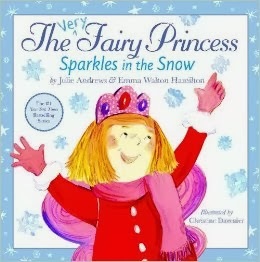 Some of you might recognize this as being a new title in a series of Very Fairy Princess books written by the illustrious Julie Andrews and her daughter, Emma Walton Hamilton. I had not read any of the other books in the series but have always been curious hence I accepted this book for review purposes. In this particular story, Gerry (the very fairy princess) is anticipating the upcoming Winter Wonderland Festival. She knows that she has great singing talent and assumes that there is no other person around who should be granted the right to sing the solo in the choir production. She rehearses the solo for her teacher at every opportunity, though seldom with permission. The soloist is eventually assigned but, much to Gerry's chagrin, not to her. However, in the end, the guest soloist gets stuck in the snow and is unable to make it to the concert. Gerry has her moment and all's well that end's well. I'd say that this story is "ok." Sorta cute. It didn't grab me and make me love it but I also don't have any objections to it. It has sparkly snowflakes on the cover. And the very fairy princess is dressed in pink. Sometimes that's enough. LB-kids has generously offered to give away one copy of each of the above titles to one of you. If you would like to win, please leave a comment below INCLUDING A VALID E-MAIL ADDRESS! THIS CONTEST IS NOW CLOSED. THE WINNER (as selected by random.org) IS #9 - Sue. CONGRATULATIONS! I was sent a copy of both of these titles by LB-Kids for the purposes of facilitating this review and giveaway. I received no additional compensation for this post and all opinions are 100% my own. I'd like to win. Especially the Night Before Christmas. Don't include me in the giveaway, but just wanted to say I didn't realize Holly Hobbie was a real person, either! I had a lot of HH stuff years ago and loved her illustrations. The night before Christmas looks amazing! The illustrations are great. And I am a huge Julie Andrews fan- I would love to have these books to share. I would love to win!! And, oh! Holly Hobbie!! LOVED HER!! Wow. The NBC illustrations ARE fabulous. I also didn't know HH was real until we received one of her books...can't think of the title, but it's a wordless books about a frog...and a girl. Lovely. thissimplemom at gmail dot com. Our grandchildren would love these books. Our granddaughter loves the Julie Andrews books! suew930@yahoo.com Thanks for the giveaway. These look like fun Christmas books. Would love to win these for my kids. 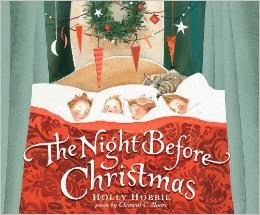 Just saw The Night Before Christmas at our local bookstore and it is darling.